Visit Ayutthaya, the Eiffel Tower, the Egyptian Abu Simbel temple and other structures - in miniature! Good place for visiting! One or two hours is enough to watch everything there. 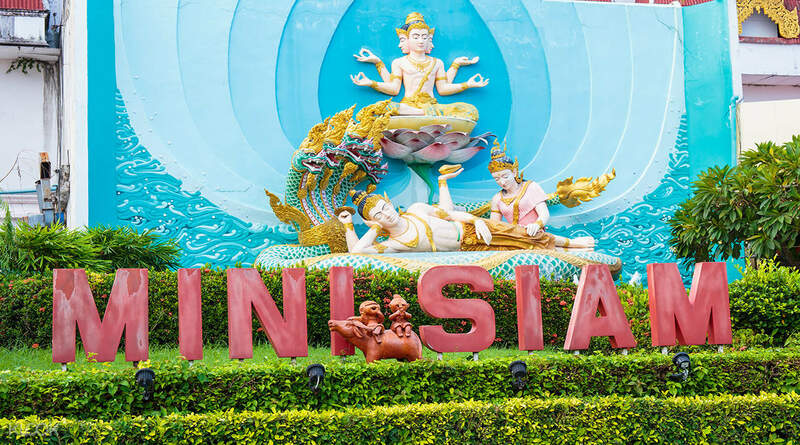 Explore the world in a day at Mini Siam where you can venture around 29 sections, largely divided into miniature Siam and Europe. The Mini Siam zone features many famous Thai temples and attractions: Wat Phra Kaeo, Wat Arun, Phanom Long Historical Park, and Ayutthaya are among the most prominent ones. Other famous landmarks featured are the Eiffel Tower, the Leaning Tower of Pisa, London Tower Bridge and Angkor Wat in Cambodia - discover more places in the Mini Europe zone. So if you're vacation days don't quite cover your endless list of sights to see, this might be your answer! A perfect place for a family outing, everyone will enjoy discovering a miniature world in a day. We arrived around 5pm and stayed until 7.30pm. It is definitely worth to watch with the lighting on, but after 7.30 it is to dark to enjoy the setting. They are open until 9pm. Drinks and snack are cheap. Worth to visit and take some pics if you are for a longer period in Thailand. We arrived around 5pm and stayed until 7.30pm. It is definitely worth to watch with the lighting on, but after 7.30 it is to dark to enjoy the setting. They are open until 9pm. Drinks and snack are cheap. Worth to visit and take some pics if you are for a longer period in Thailand. One of the greatest place. Get to enjoy mini siam and mini europe. Make sure u visit around evening as they will turn on the lights! Again, purchasing ticket through Klook is always a good idea. Money saved, get ticket by showing qr code or vouchers. One of the greatest place. 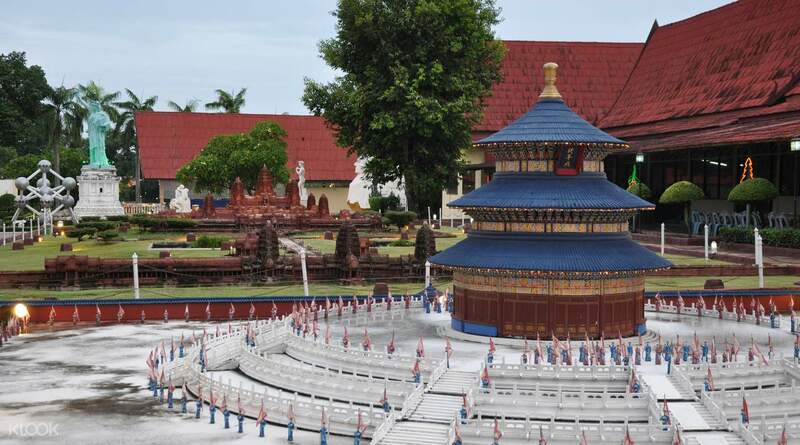 Get to enjoy mini siam and mini europe. Make sure u visit around evening as they will turn on the lights! Again, purchasing ticket through Klook is always a good idea. Money saved, get ticket by showing qr code or vouchers. Awesome place to take phot. Cheaper price via Klook and redemption of ticket very easy and fast. We went at around 5pm and took 2 hours which has chances to view the night scene where the lights were on. Some parts is not well maintained though. Awesome place to take phot. Cheaper price via Klook and redemption of ticket very easy and fast. We went at around 5pm and took 2 hours which has chances to view the night scene where the lights were on. Some parts is not well maintained though. The park left a pleasant impression. He has original sculpture of buildings of all world. Small buildings of temple and big sculpture of Egypt, famous structures and bridges. All in miniature. convenient to take pictures. Very beautiful park! The park left a pleasant impression. He has original sculpture of buildings of all world. Small buildings of temple and big sculpture of Egypt, famous structures and bridges. All in miniature. convenient to take pictures. Very beautiful park! you are not regret if visit this place. such a feelings that one day saw the whole world. thanks klook we did it. you are not regret if visit this place. such a feelings that one day saw the whole world. thanks klook we did it. dose not enjoyed much but I got discount on klook so my money doesn't wasted much took lot of photo no klook then dont visit. dose not enjoyed much but I got discount on klook so my money doesn't wasted much took lot of photo no klook then dont visit. Good place to spend 2-3 hours.. Place has miniatures from across the world. The miniatures would look great during evening with the focus lights on. Good place to spend 2-3 hours.. Place has miniatures from across the world. The miniatures would look great during evening with the focus lights on. Lots to see, quite big inside. Can spend however long you like inside depending if you want to take photos with everything and read or just walk through. Staff keep grounds clean. Arrows show you the way around just follow and go on your own, no staff to guide you. Plenty of shops to get a drink or ice cream but no other food. Enjoyable little place. Lots to see, quite big inside. Can spend however long you like inside depending if you want to take photos with everything and read or just walk through. Staff keep grounds clean. Arrows show you the way around just follow and go on your own, no staff to guide you. Plenty of shops to get a drink or ice cream but no other food. Enjoyable little place. Great experience, must visit for everyone. Around the world experience at one place. Great experience, must visit for everyone. Around the world experience at one place.